I’m sorry I’ve been sort of boring on this little blog lately. It’s just that not much has been going on. And also blogger was being a pain yesterday and wouldn’t let me post any comments on other blogs. Hopefully it’s fixed today. I love reading comments from readers and know other bloggers do too! Lately I’ve been obsessed with Pinterest. For those of you who don’t know, Pinterest is a place where you can pin photos of all kinds of stuff: food, fashion, home decor, decorating ideas etc. I could spend SO much time looking though everyone’s pins! Find me on Pinterest HERE….and follow me! Oh and if anyone wants to buy me a mason jar drink dispenser I’ll love you forever. In other news, we learned this week that Wrigley suffers from spring-time allergies. And because of said allergies he has a skin infection on his left ear. Which means no swimming for two weeks! My poor little guy LOVES to swim, so I feel really bad for him. Especially because we are going up to the lake this weekend. Poor guy will have to just enjoy riding along in the boat instead! He’s also on a medication that makes him have to go to the bathroom frequently….which means 1:30 a.m. wake up calls for me and coming home on my lunch break to let him out. It’s only for two weeks, so it’s not that big a deal…and I can already tell that he feels so much better. And now for another random topic…is anyone watching The Real Housewives of New Jersey? Please tell me I’m not the only one obsessed with their crazy drama. I can’t get over Teresa and her obnoxious behavior, and I sort of feel bad for Melissa having to deal with her all the time. But the only one I really like is Caroline…she seems to have her act together. Even though I think they’re all crazy I just can’t seem to get enough! I think that’s all I’ve got for today…I promise I’ll be more exciting soon! « Bathroom progress and not much else…. Wrigley is so stinkin cute! Love NJ Housewives! Love reality TV for that matter..haha…couldn't take my eyes of last weeks episode. Could not believe the fight that went down at the cristining..trash lol..but I love it. Have a good day! ..by the way..your dog is ADORABLE! I am OBSESSED with pinterest too… 🙂 I can't get enough! Aww poor Wrigley (and you for having to make those 1:30am wake up calls – yuck)! But I'm glad you all found out what it was and are getting it treated so he can be back to his water-loving-self, soon! That picture is too cute! Awww poor Wrigley, he will be bummed that he can't go swimming, I know how my two are… lol!! I also agree on the problem with commenting… come on blogger! !…known in my luck I will have wasted writing all of this, just for it to tell me it didn't work! Ha! i'm obsessed with ALL the RH of everywhere. except i didn't get into miami and DC was pretty lame. good thing they aren't coming back. dina was my fave…i heard she's getting her own show. i want that drink dispenser SO BADLY. seriously, its adorable. and a must, must, must have. and YES RHNJ is baaack and i love their drama. They're insane. its awesome! I need to check out pinterest, I feel like I'm missing out- everyone is talking about it! And poor Wrigley I know he'll be sad he can't go swimming this weekend, but I'm glad he's getting better! 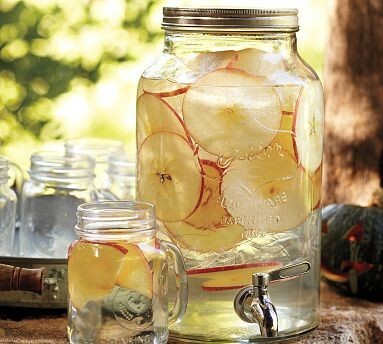 That mason jar drink dispenser is so you! I also LOVE real housewives of NJ! I can't believe what went down last week at the baptism. I mean how can they act like that, they are brother and sister! Hope you guys have a great time on the boat this memorial weekend. Oh, and I was definitely eyeing that mason jar dispenser yesterday. I was looking for beverage dispensers for my friend's bridal shower, but the price was a little too steep! wrigley is so cute! i have a golden with springtime allergies too! I'm right there with you with the real housewives. Can't get enough! I love that mason jar drink dispenser! Pinterest = AMAZING. Oh neat! I've never even heard of Pinterest but it looks awesome. Thanks for the intro to it!! Ah yes completely and utterly obsessed with RHONJ!!! Ugh, I can't stand watching Jacqueline and Ashley's relationship…it drives me crazy! OMG, I LOVE the RH of NJ…they're nuts!! But makes for great TV…Melissa is a great addition! 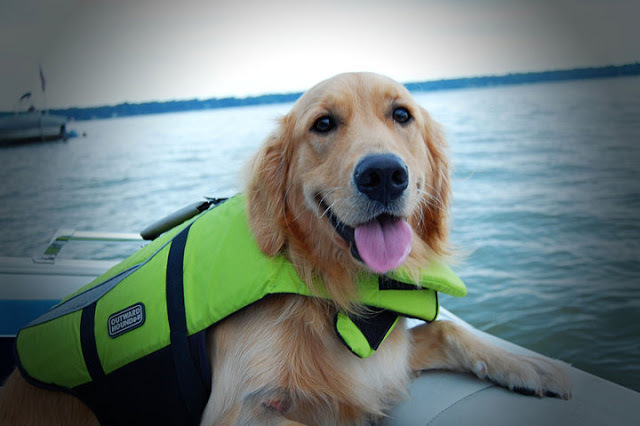 OH and we want to get a life jacket for Wilson this summer…he's never been on the boat and I bet he'll love it. Love Wrigley! We took our bigger pup swimming for the first time yesterday and he loved it! He is a natural. Does Wrigley swim in the lake or somewhere more shallow? It's hard to take my eyes away from Real Housewives of NJ…have you seen Pregnant in Heels? LOVE watching that. I Love the pinterest website! Awesome! And yes, I am also a RHONJ fan.. It's pathetic that grown adults can't act like it at a CHRISTENING!